With Magellan World you can avoid the nightmare of lost property. From lost bags to passports and purses, we have something that will work for you. 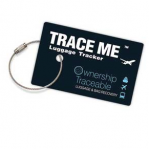 Promotional lost luggage tracking is the perfect addition to your promotional merchandise range and are an effective method of reuniting lost items with their owners. 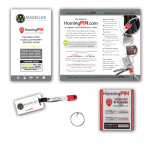 Homingpin puts the owner and finder of lost property together, so that mislaid items can be returned quicker. Traceme is the smart way to help protect your bag and it's content from loss. The unique serial number acts like an international passport for your luggage. 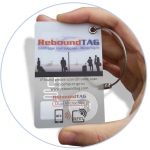 Rebound tag uses RFID microchips, NFC, barcodes and printed numbers. Don't lose your luggage - Micro chip It! 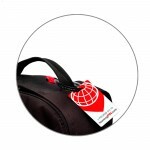 WE are currently offering 10% off our range of Promotional luggage trackers. Simply enquire about an individual product or fill out the form on the right. Magellans endless pursuit of the best prices for branded luggage tracker items in the UK make us confident that you will not get a better product at a better price. We will price match any genuine quote for the same product offering. The one thing you are sure to receive from Magellan is our award winning customer service. From your initial enquiry through to receiving your professionally branded luggage tracker items. The Magellan team have over 20 years of expertise within the merchandise industry. We can guide you through each stage of your order and can recommend the right branded luggage tracker items for your event or promotion. Our knowledge of products and all the branding methods make us the perfect partner. HomingPIN puts the owner and finder of lost property together, so that mislaid and lost property can..
Have you ever lost your luggage while travelling? Most of us have at some point in our lives. Its .. TRACE ME luggage tracker is the smart way to protect your bag and its contents from loss. TRACE ME i..